300Blackout is very attractive for short range (which is where 99 point something percent of defensive uses happen). It throws twice the lead of the .223Rem at reasonable velocity (ballistics approximate 7.62×39 but bullet selection is better). While subsonics are available for suppressed use, I would think the barrel twist would be optimized for one or the other, and SU16 is probably meant for 115-125gr range more than for the 220gr. AR15 magazines work, so less logistical overhead on that. The down side to 300BLK are the cost of ammunition, about $10/20 at this time vs. $6.50/20 for .223 (comparing same brand and bullet type). Less flat trajectory won’t come into play under 150 yards, while much better barrier penetration probably would. SU16 is a lot like vz58 in 7.62×39, short, light and handy. For iron sight use, minimal offset over bore should help with accurate shot placement. Piston design helps to keep the action clean: I can’t remember when I last cleaned my .223 SU16s, but they keep on working despite the extra fouling associated with sound suppression. Availability? Depends entirely on your local gun shop, as Keltec sells through distributors and the store can go to several sources. I see plenty of SU16s in .223 locally, I assume 300BLK version would become more common shortly. The optic shown is a Vortex Razor. 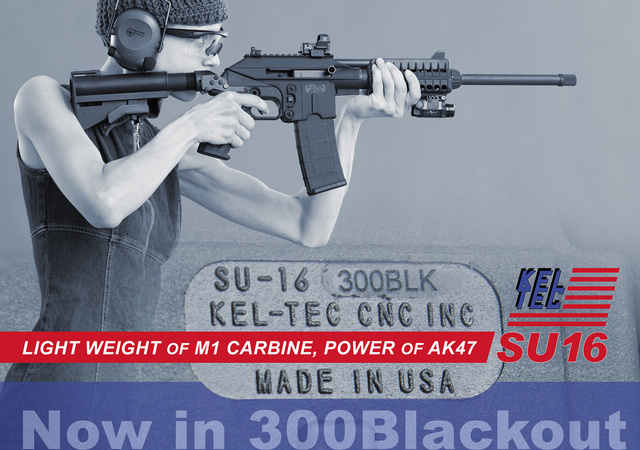 This entry was posted in ammunition, rifle and tagged 300BLK, carbine, keltec, re dot, SU16. Bookmark the permalink. 6 Responses to SU16 available in 300Blackout chambering. Is this definitely in the pipeline then? Last I heard they were showing the prototype at SHOT to see what response they’d get, and things have been pretty quiet since. Of course that was 8 months ago. Does it officially have a green light? Judging from the serial number, it’s one of many produced. But the one you’re photographing is a prototype, yes? The caliber marking is a re-stamp with the 5.56 milled off, meaning, I would assume, that the serial # started out as a 5.56 Charlie, rather than being a production item. Photos of the prototype popped up on KTOG about a year ago, and I’m eagerly hoping it becomes a production item. It would be my next Kel-tec. I’ve also had this one since early Spring. Kel-Tec doesn’t list it on their site…., but then, they don’t seem to do much to keep their site fresh either.